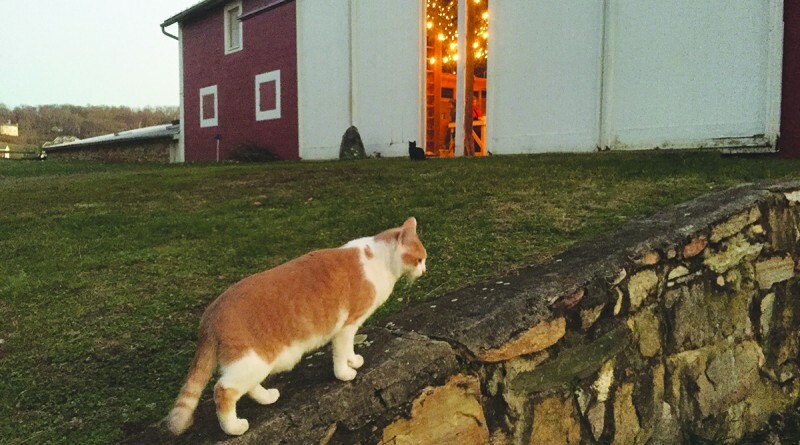 Two of the first felines to be adopted as part of the Loudoun County Animal Shelter’s new barn cat program have settled in comfortably at Heidi Heider Chapple’s Hope Farm bed and breakfast near Waterford. The Barn Cat Program allows felines that don’t fit into a traditional family home setting to still live out happy lives. These cats could be used to an outdoor environment, semi-social or even semi-feral, and be good pets to be placed in safe locations like barns, farms, businesses, garages and more. Cats that fell into this category were previously not placed for adoption by LCAS and oftentimes were euthanized, according to LCAS Director Nina Stively. Now, opening up this adoption category gives these felines a second chance at finding a forever home in an environment better suited to their needs. All cats that come under LCAS’ care are spayed or neutered, vaccinated and micro-chipped. Those interested in being considered for a “barn cat” may contact LCAS to have their name placed on a list. Shelter staff members will contact individuals if a feline becomes available for adoption under the program. To have your name placed on the list call 703-777-0406, or go to loudoun.gov/animals for more information. Here’s a good read to show you what happens to every last one of these relocated invasive-species disease-infested vermin feral-cats that people dump-off on farms and in other rural areas in ANY location of North America and aren’t kept contained. All they are doing is adding to the cat-shooting quotas of everyone who lives rural. What a nice waste of their money and time. I personally shot and buried hundreds of these invasive-species vermin to stop them from gutting-alive and skinning-alive the last of the native wildlife on my lands. Cats that morons adopted-out from “humane” barn-cat programs. Many hunting-forums even pass along contact information of any new “barn cat programs” — for free delivery of practice-targets between hunting seasons. I don’t condone this, because if they miss then I have to shoot them myself when they wander into my own lands. *”Hello? Yes, I have a bad rodent problem out here in the country. Can you bring out about 6 of your cats? Thanks!”* (A week later: BANG! BANG! Damn, missed one. BANG! BANG! BANG!) Their cats are “valuable”, alright. But not in any way that they might ever think. Cats that are relocated NEVER stay where they have been dumped. This is why you read reports of cats trying to get back to their points of origin hundreds of miles away. All the while senselessly destroying countless numbers of valuable native wildlife in their wake by torturing animals to death for their hourly play-toys. People in rural areas have enough of their own problem keeping these disease-infested vermin in check by shooting every stray cat they see (if only to protect their own animals and cats from all the diseases these free-roaming pestilent cats carry). Don’t go adding to everyone’s weekly cat-shooting-quotas by releasing more of these pestilent vermin. “Cute” they are not. They ALL need to be destroyed. There are dozens of native predator species that are MUCH better suited for rodent control. Ones that eat rodents only and don’t destroy everything that moves, like cats do. There’s a good reason one species was even named the “Barn Owl”. Gray-Fox being another excellent mouser, they don’t even have European fowl on their menus and will even climb trees to keep squirrel populations in check. Even the 1.75-inch Masked-Shrew, a David & Goliath success story, evolved a poisonous bite specifically for preying on rodents right where they breed. Even the scent of them being around drives away rodents. But what do your cats do? They destroy these most beneficial of all rodent predators the very first chance they get. Cat-lickers need to become responsible stewards of this planet by getting at least a high-school level of education in matters of ecology and biology so the rest of us don’t have to teach them a valuable lesson by shooting and burying every last one of their invasive species vermin cats for them. If people advocate for cats as rodent-control on farms and ranches they’ve already doomed them to being destroyed by drowning or shooting when it becomes a financial liability more than any asset. Ranchers and farmers worldwide are fully aware that cats’ Toxoplasma gondii parasite can cause the very same birth defects (hydrocephaly and microcephaly), still-births, and miscarriages in their livestock and important wildlife as it can in pregnant women. Consequently, this is also how this cats’ brain-parasite gets into your meats and onto your dinner-tables, from herbivores ingesting this cat-parasites’ oocysts in the soils, transferred to the plants and grains that they eat. Herbivores can contract this parasite in NO OTHER WAY. Not even washing your hands or garden-vegetables in bleach nor hydrochloric-acid will destroy this parasites’ oocysts if you have contracted it from your garden or yard that a cat has defecated in. This is why any cats are ROUTINELY destroyed around gestating livestock and wildlife-management areas in the most efficient, humane, and least-expensive method available. Common rural practice everywhere. The risk of financial loss from dead livestock and important native wildlife from an invasive-species cat is far too great to do otherwise. This cats’ parasite is now even killing off rare marine-mammals (dolphins, seals, otters, and even rare whales) along all coastal regions around the world from run-off containing this cat-parasites’ oocysts. The next time cat-lickers bite into that whole-grain veggie-muffin or McBurger, they need to just envision biting down on a shot-dead or drowned kitten or cat. For that’s precisely how that food supply got to their mouths — whether they want to face up to it or not. It’s not going to change reality no matter how much they twist their mind away from the truth of their world. If they want to blame someone for the drowning and shooting of cats, they need to prosecute themselves — every time they eat. Enjoy your next meal! At least 1 cat paid for it with its life. These are just the diseases these invasive species vermin cats have been spreading to humans, not counting the ones they spread to all wildlife. THERE ARE NO VACCINES against many of these, and are in-fact listed as bio-terrorism agents. They include: Afipia felis, Anthrax, Bartonella (Rochalimaea) henselae (Cat-Scratch Disease), Bergeyella (Weeksella) zoohelcum, Campylobacter Infection, Chlamydia psittaci (feline strain), Cowpox, Coxiella burnetti Infection (Q fever), Cryptosporidium Infection, Cutaneous larva migrans, Dermatophytosis, Dipylidium Infection (tapeworm), Hookworm Infection, Leptospira Infection, Giardia, Neisseria canis, Pasteurella multocida, Plague, Poxvirus, Rabies, Rickettsia felis, Ringworm, Salmonella Infection, Scabies, Sporothrix schenckii, Toxocara Infection, Toxoplasmosis, Trichinosis, Visceral larva migrans, Yersinia pseudotuberculosis. [Centers for Disease Control, July 2010] Bird-flu, Bovine Tuberculosis, Sarcosporidiosis, Flea-borne Typhus, Tularemia, and Rat-Bite Fever can now also be added to that list. You did know too, didn’t you, that giving a rabies shot to a cat that already has rabies does not cure it of rabies? Google for: RABID KITTEN ADOPTED WAKE COUNTY (for just one example of hundreds of rabid cats adopted from outdoors, given their rabies shot, but still transmitting and then dying from rabies). The incubation period for rabies is, on average, from 21 to 240 days, sometimes up to 11 months, one rare case being 6 years. A vetted cat can STILL transmit rabies many months later (during the last 2 weeks before it dies of rabies, sometimes not even showing any symptoms up to the point of its death) if it was harvested from unknown rabies-exposure conditions with an unknown vaccination history. May one of those cats that they adopt-out have rabies too. Is their liability insurance in excess of $10M? Either quarantine them for 6 or more months in a government-supervised double-walled enclosure system at their OWN expense (as required by national and international pet-trade, import/export, and animal-transport laws), or euthanize them. Those are everyone’s only 2 options to be relatively certain they are not handing rabies to someone. Isn’t reality fun? Rabies outbreak caused by TNR! 50+ pets euthanized. ALL stray cats destroyed. All livestock destroyed. More than a dozen homeowners pay for their own $5,000-$8,000 rabies shots for EACH family member. There’s hundreds more like those on the net showing everyone how these phenomenally ignorant and foolish cat-lickers “help” their communities by allowing TNR CAT-HOARDERS to continue their criminally negligent behavior. And contrary to these cat-lickers’ perpetual LIES, feeding stray cats TRAINS them to approach humans for food. What do you think happens to the child or foolish adult that reaches down to try to pet or pick up that now seemingly friendly “cute kitty” that just approached them? The wild animal lashes out and bites or scratches the hand that has no food for them. Resulting in $5,000-$8,000 rabies shots for each victim of a cat-feeder’s criminally negligent behavior, paid for out of the victim’s OWN pockets. Two reports even document rabid cats entering a pet-door and one even came through the family’s ceiling in search of human supplied foods, the attack so bad that the whole family required hospitalization. Then there’s cats’ most insidious disease of all, their Toxoplasma gondii parasite that cats spread through their feces into all other animals. This is how humans get it in their dinner-meats, cats roaming around stockyards and farms (herbivores can contract this parasite in no other way). This is why cats are routinely destroyed around gestating livestock or important wildlife by shooting or drowning them. So those animals won’t suffer from the same things that can happen to the fetus of any pregnant woman. (Miscarriages, still-births, hydrocephaly, and microcephaly.) It can make you blind or even kill you at any time during your life once you’ve been infected. It becomes a permanent lifetime parasite in your mind, killing you when your immune system becomes compromised by disease or chemo and immunosuppressive therapies. It can last over a year in any soils or waters and not even washing your hands or garden vegetables in bleach will destroy the oocysts. During dry-spells of weather (or inside low-humidity homes) when the oocysts become dessicated you can even contract T. gondii by just inhaling the air wherever any cats have defecated and the oocysts have become airborne/aerosolized. Contrary to cat-lickers’ self-deceptive myths, a cat can become reinfected many times during its life and spread millions of oocysts each time. It’s now linked to the cause of autism, epilepsy, schizophrenia, memory-loss, and brain cancers; as well as increasing the suicide rate in women almost 2-fold even though they’ve never suffered from any mental or emotional health issues previously. This parasite is also killing off rare and endangered marine-mammals (all the way up to rare whales) along all coastlines, along with inland river-otters, from cats’ T. gondii oocysts in run-off from the land, the oocysts surviving even in saltwater. A catastrophic ecological disaster of multi-continent-sized proportions worse than any oil-spill that has ever existed or could even be imagined. Cats attract rodents to your home with their whole slew of diseases (like The Plague from rats and fleas, many people have died from cat-transmitted Plague in the USA already, it is alive and well and being spread by cats today). If you want rodents in your home keep cats outside of it to attract diseased rodents to your area. I experienced this phenomenon (as have many others), and all rodent problems disappeared after I shot and buried every last one of hundreds of cats on my lands. Much better NATIVE rodent predators returned to my lands, rather than these man-made cats that were just attracting more rodents. It is interesting to note that these Toxoplasma gondii oocysts shed by cats can even survive the hydrochloric stomach acids for the duration that they remain in a mammal’s digestive tract. And then they doubt my words when I tell them of the studies where they found that this parasite’s oocysts (seeds) can even survive washing your hands in bleach. You could wash your hands and garden vegetables in hydrochloric acid and digestive enzymes for the same duration that food remains in an animal’s digestive tract and even that won’t destroy it. Your hands would be dissolved into a digestible pulp long before you could kill the Toxoplasma gondii oocysts. Yeah, “basic hygiene” is going to keep your kids safe from going blind sometime during their life, becoming autistic, schizophrenic, get ADHD, suffer from epilepsy, get brain-cancers, debilitating depressions, suffer from memory-loss, commit unexplained suicides, suffer from other neurological illnesses, or die if they ever require any immunosuppressive therapies or contract any immunity-compromising diseases during their lifetime if they had ever played in a sandbox that a neighbor’s cat has defecated in. Go ahead everyone, drink the cat-lickers’ Kool-Aid. Someone who will save the life of one of their clearly expendable vermin cats over yours is not to be trusted by any other human alive on this planet. Even cat-lickers can’t trust their fellow cat-lickers to save each others’ lives when it comes right down to it. Truth is, they’d even rather that their own family and friends die (if they have any) than any of their deadly disease-infested cats. Sociopaths and psychopaths, one and all, right to their very cores. WARNING: This cat may be harboring rabies that will be discovered up to 11 months from now, in rare cases up to 6 years. (It also wasn’t tested for any other of the 3dozen+ zoonotic diseases cats spread to all other animals and humans today. Many of these diseases being deadly, some even listed as bio-terrorism agents for not having vaccines available for them. It was not tested because we don’t care if you nor any other of your family-pets contract any of these diseases.) Keep in mind that giving a wild-harvested cat a rabies-shot does not cure it of rabies if it already has rabies. It may or may not show any symptoms up to the point of its death. We have no way of accurately testing for rabies by keeping this cat alive. And since we are cat-hoarding sociopaths and psychopaths and care more about the life of this cat than your own, more than the life of any other human or other animals on earth, we also didn’t quarantine it in a government-supervised double-walled enclosure system for a period of not less than 6-months before handing it over to you — as required by all national and international pet-trade, import/export, and animal-transport laws. There have been many rabid cats adopted-out from TNR colonies over the years. This resulting in the adopters having to obtain post-exposure rabies shots costing them in excess of $5,000 per family member. As well as costing over $1,000 per month, for a period not less than 6 months, for quarantining each family pet that came in contact with the rabid cat that was adopted from an outdoor source — just like we adopt them out with our own criminal-negligence. You should also know that you are at more than 4-times greater risk of contracting rabies from any cat today due to these highly illegal TNR (trap, neuter, re-abandon) programs and all stray cats than any other domesticated animal. If you adopted a cat from us and it dies from rabies you must pay for all these costs on your own. In one well-known case the family who adopted one of these rabid cats from a shelter’s TNR program went into bankruptcy to handle the costs — just so you know. We take no responsibility for rabies nor any other of the 3dozen+ potentially deadly zoonotic diseases, for which it was not tested, now being in your home or killing any of your family or other beloved animals.